Homeowners, tenants, and businesses need to be cognizant of the danger posed by heavy snow loads on roofs, and the warning signs of potential structural weaknesses. In some instances, the risks posed by accumulated snow on roofs can be mitigated by safely removing snow from roofs of both commercial buildings and homes. Removing snow from rooftops will minimize the likelihood of structural collapse. Flat and low pitched roofs, most often found on industrial buildings, but are also used in certain home designs, are at the greatest risk of buckling under heavy snow and ice accumulations. Lower roofs, where snow accumulates from higher roofs are also vulnerable. • Ice dams can cause major damage to a home or building. Ice dams occur after a heavy snowfall, followed by several days or even weeks of very cold weather. 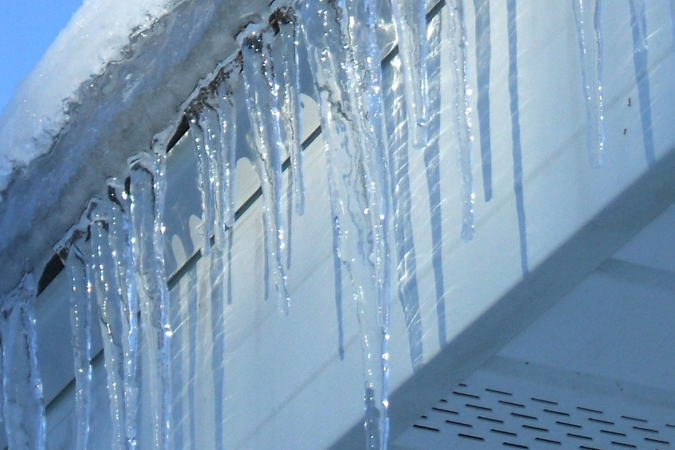 An ice dam is a wall of ice that forms at the edge of the roof, usually at the gutters or soffit. When it forms, the water backs up behind the ice dams and creates a pool. This pool of water can leak into your home or business and cause damage to walls, ceilings, insulation and other areas. DPS directs consumers to the WT Phalen Insurance web site for additional information and guidance about how to cope with ice dams. • Clear snow away from downspouts so water has a place to go. • If you are going to use a snow blower, make sure that it has been approved by a structural engineer to be used on a roof, and that the blower is set to a high level above the roof so as not to damage roof membrane. • Use a snow rake for pitched roofs (available at most hardware stores) to remove snow from your roof. • Start from the edge and work your way into the roof. Try to shave the snow down to a 2 or 3 inches on the roof instead of scraping the roof clean, which will risk damage to your shingles or other roof covering. Keep in mind that any metal tool could conduct electricity if it touches a power line. Also, metal tools will do more damage to your roof. Most plastic shovels are better, except for the ones with curved blades-those too will do some damage to your roof. • Keep gutters, downspouts and drains clean. Remove large icicles carefully if they’re hanging over doorways and walkways. • Wear protective headgear and goggles when performing any of these tasks. • Call your local building or fire official. • If there is imminent danger, evacuate the building and call 911. • Many fire departments have regional technical rescue teams available to local departments in case of collapse. • Massachusetts Task Force 1 is an Urban Search and Rescue Team in Beverly. The team is comprised of Police, Fire, EMS and Civilians who respond to major disasters under a contract with the Federal Emergency Management Agency (FEMA). Currently there are 150 people on the MATF-1 team. This entry was posted in Local News, Office and tagged rooftop snow removal by Tamara Small. Bookmark the permalink.